FGS Composites has abundant capabilities to build components and other items for simulators as well as the construction of the whole structures. 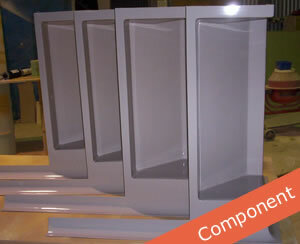 Whether it is dynamic or static, we can fabricate all types to suit any requirements. Recently we collaborated with a major rail carriage builder to create four simulators for driver and guard training. One unit is built on a mobile trailer, two units are stationary and the last is a dynamic simulator. Among other projects in the past we have built is a hovercraft cockpit for training pilots in flight operation of these specialist craft. The construction project of this particular simulator was extremely interesting. In this assignment we had to provide the sense of drifting. We achieved this by using air to get the simulator floating and tethering it to the ground with straps. The controls for the tilt and the 'for and aft' movement were pneumatic rams and gas struts which also held the simulator to the base. The surrounding area around the simulator was screened off and day light projectors were used to create the appropriate environment. The client was extremely happy with the results, however the service agreement we have with our client unfortunately prevents us displaying any photographs. As with many similar projects we remain respectful of sensitivities to publication. 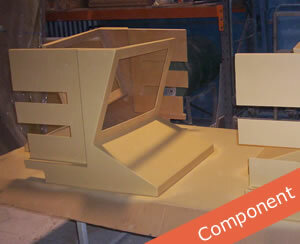 We are however, able to show a small sample of pictures of components made by FGS Composites. FGS Composites invites you to discuss your projects with us. No matter what it is you wish to know about simulators, we will be happy to assist in any way that we can. We can support you in design work, CAD drawings, planning, project management and the execution of the construction.